I have an Acer Aspire One which I received new out of the factory sealed box as a birthday present in 2009, and immediately converted it to linux after receiving it – Fedora 11, to be exact. It has used, as I recall, Fedora 11, 12, 14, 15, possibly 16, 17, and 19, all without any trouble. Well, ok, none that can’t be attributed to “whaddya expect out of a notebook vs. a full horsepower machine” and errors stemming from somewhere between the keyboard and the chair. ? However, time is starting to march on with this machine, and while it was great under roughly 18 months of Fedora 19, it was clearly starting to slow down a bit, but … well, Fedora keeps releasing new versions, and, well, while CentOS 7, which is based on Fedora 19 and which I’d be happy to install on my netbook, unfortunately is only available under 64bit while my netbook is only 32bit. So my options were to either keep Fedora 19 unpatched, upgrade to Fedora 21 workstation, which I wanted to do, upgrade to Fedora 21 with XFCE, which would probably make it peppier, or explore other distros, which I don’t wish to do. When Fedora 21 Workstation came out in December 2014, I downloaded the 32 bit version, and the fun began. Within a couple of minutes of booting up the live DVD and before the desktop loaded up, the machine went into hibernation. This didn’t feel right, but I hit a key and things came back to life. Then, within about a minute, the machine went into hibernation again. I hit a key again, got a minute of performance, and it hibernated again, ad nauseum, and ad infinitum, literally. Despite this, I decided to continue with the F21 Workstation installation anyway, and I ended up babysitting the install, hitting a key to wake up the system every minute or so during the installation. On a single core atom processor running at 1.5 GHz, this took a good long while and a lot of keyboard wakeups. Finally, the system was installed, but it kept on hibernating after roughly a minute. As a reference, I proceeded to install Fedora 21 XFCE Spin, and, except for hibernating once during the initial booting up of the liveDVD, it worked like a charm. One solution I tried was to do a “yum install fedora-release-workstation” or somesuch from an installed XFCE spin, hoping to then do a “yum groupremove XFCE” and repeat “yum install fedora-release-workstation” just to reinstall any packages which may have gotten removed, but it bricked the install and I had to reinstall XFCE yet again. For a variety of reasons which are now lost in the winds but which probably included having gone through the following suggestions from ask.fedoraproject.org, I managed to install and re-install the XFCE spin several times again after probably having reinstalled the Workstation a few times in between. I went to ask.fedoraproject.org to ask for help (here’s my archive), and I got a few interesting responses. “You can do tests and get logs without interference with systemd-inhibit – ie sudo systemd-inhibit bash. The system won’t suspend or hibernate until you end the process invoked with systemd-inhibit.” This didn’t work; hibernation continued as before. The next response was “I’m just guessing, but it feels like the system thinks that the battery is almost empty and because of that does the right thing in that situation. I’m not sure which software component is handling this situation but anyway, there seems to be a bug that happens to manifest on your particular environment.” This could have been ruled out immediately – mostly – because at the time the battery was physically out of the machine when I tested, and I was running on mains electricity out of the wall. Nonetheless, I did check, with a fully charged battery in, to be sure I wasn’t being a fool; no such luck, under both cases, the machine kept on hibernating every minute or so. All through this, I learned that at least one user with a Toshiba Satellite Pro without a CD player had this same problem, and worked just fine up till Fedora 20. To wit, my brother and I, after I’d installed Fedora 21 Workstation for the probably at least third time, then boot up an XFCE liveDVD (but do not install it), and through some of my brother’s linux kung-foo, he mounts the hard drive, using Thunar in the XFCE spin as a facilitator, and we edited the appropriate file. … and, it seems, my instructions, posted on ask.fedoraproject.org, helped at least one other user with an Acer Aspire one. I’m pleased. ? Now, as for what I think of it … well I like F21 Workstation. On my laptop, it’s a slightly sluggish, but still working well. Hotel internet access passwords â€” Hereâ€™s a case for Captain Obvious and Well Hallelujah! Big Brother has finally acted! Well here I am in 2015 writing again on the subject. As you can guess, I’ve used plenty of motels and hotels in the intervening almost six years. As you can guess again, I’ve pretty much given up on my rant since then. And, as you can guess yet again, I’m currently sitting in a motel, using their WiFi. And can you guess what comes next? Well, when I checked in, they asked me “Would you like WiFi access?” which tipped me off to ask about whether or not the passwords are auto-generated each time someone checks in. Of course the poor lady was bewildered by the question, to which I responded, “Don’t worry, I’ll have the answer to my question when you hand me that ticket.” And whaddya know, it had a wifi access code that was obviously created on the spot after she’d clicked once or twice on her keyboard and looked at the screen before writing on the ticket. Not too too strong at only five alphanumeric characters, but it wasn’t a dictionary word. The sign in page said that the code was case-insensitive. My untrained eyes would guess it would only come up in a brute force attack, if someone were willing to try all 60,466,176 possible combinations, assuming it’s just the 26 letters in the alphabet and the 10 digits, with no special characters, and they only give out codes five alphanumeric units in length. Of course this ignores the fact that only the “currently active” codes are, well, active, that the system probably has some kind of maximum tries per period of time per mac address, and the like. Of course this story’s postcript is that when I entered the code, it didn’t work — so I called to the front desk to report this and ask for a new one. Whaddya know, Big Brother not only has finally acted, he keeps records — the nice lady asked “Is it such and such?” I answered “not quite, here’s what’s written.” Turns out, the handwritten part of the code that said “U1” sure looked like a “W”. Having to find multiple levels of internet access — oh, fun! Disclaimer: I am musing on the challenges I faced while trying to secure reliable internet I required during a recent set of business trips, and the process of developing various solutions to these challenges. These challenges are, in a general fashion, typical of the routine logistical challenges I face when in-the-field, and no doubt of other field technicians. In no way am I trying to reflect negatively on my employer, who for the purposes of this entry shall remain nameless. I was recently on a couple of business trips, depending on an iPad as a critical part of the execution of the contract. This trip was to a small city of 25,656 (according to Wikipedia), big enough to have plenty of internet access points, cell phones, and cell phone data. As far as I was concerned, in fact, I was in a mini-mini version of Montreal, home for me, to those who haven’t figured it out yet. The way the iPad is set up, wifi internet access is required to transfer building plans needed to do the work to the iPad, and transfer back files and data collected from my field work. I have made no bones mentioning to some key people heading the overall project that this is a potential Achilles’ Heel to the execution of the project, since, at least in the overall project’s fringe locations sufficiently beyond population centres, internet access would be a spotty luxury at best. My trips were at least symbolically close enough to the edges, underlining the potential problem. 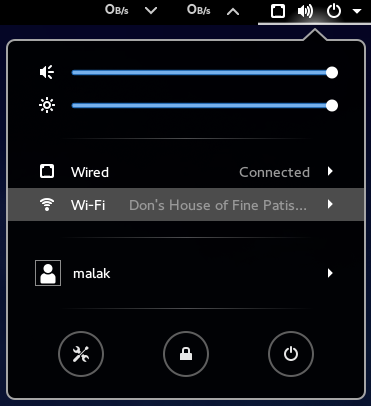 One of the first challenges I found was that the iPad didn’t seem to play well with the internet supplied in the motel (DataValet); although I did manage to get it to work once, it proved a bit too frustrating to get working reliably. A colleague confirmed that he’d had similar problems getting Apple products to connect to DataValet. I had no trouble getting my personal computer running Fedora 21 Workstation to work with DataValet: In fact, besides not recalling having trouble over the years connecting to wifi that wasn’t specific to Linux or Fedora, I would actually say that the experience was even easier than in the past, since the daily leases seemed to automatically renew, although it seemed to insinuate itself by an “convenient” automatic popup window. In parallel, my work Windows-based machine also worked flawlessly throughout with DataValet, although if I remember correctly, I may have had to occasionally open up a browser in order to renew the leases. 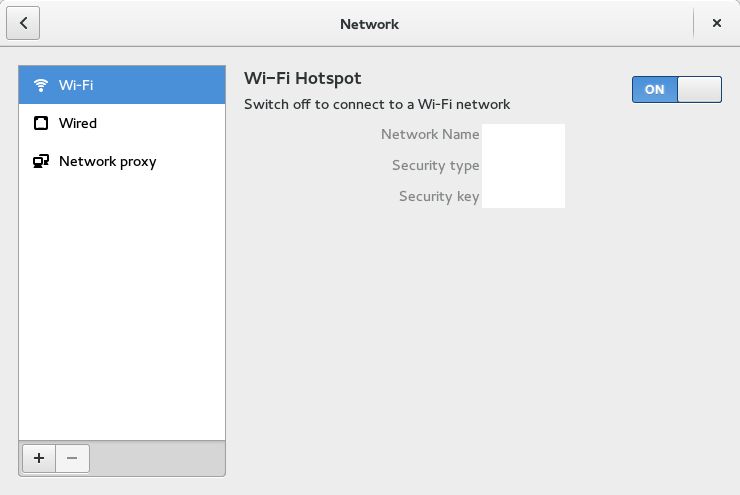 Add to this challenge, my employer’s local office didn’t seem to have wifi, or at least, assuming that it *was* there as a hidden network, my work computer didn’t automatically connect to the corporate wifi when not plugged in to the corporate network, which it normally does at my home office. This led to a second solution: I used my personal phone to create a hotspot and consumed a bit of my personal data plan, which didn’t bother me too much, at least until it were to involve overage charges. Not that I checked, but based on the little amount of time I used it, I’m sure I never got into that area. The next solution also created another challenge due to a flub on my part: My client finally gave wifi access to the iPad at her various locations; however, I should have requested that she also enable my work computer, since I had a secondary need for internet given that I developed a need to produce or modify extra plans several times once arriving at some sites, and as such a need to transfer the plans off the computer and onto the iPad. 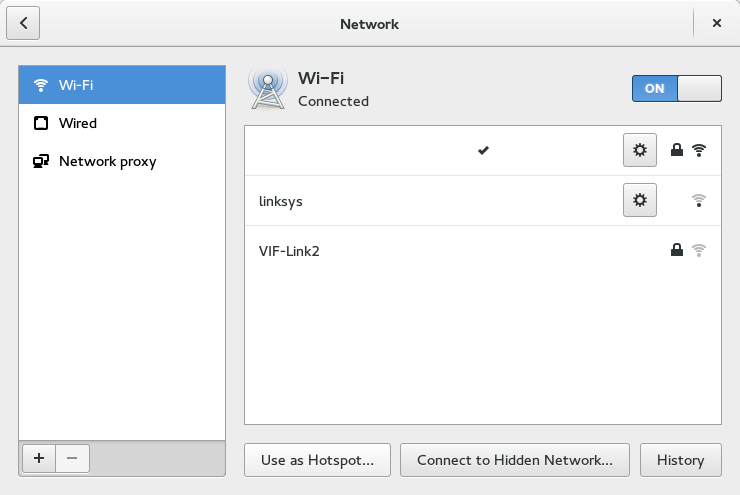 Finally, I realized that when I have wired access, I had yet another solution available to me: I could set up my linux laptop to create a wifi hotspot. This was rather easy, at least under the current gnome version in Fedora 21 and I believe has been for quite a while under the gnome 3.0 series, and probably before too. Unfortunately, this was wasn’t a solution at the motel since it only had wifi and no wired access, and I didn’t have an external wifi receiver with a cord to provide the wired internet and free up the wifi card. Feeling a bit curious along the lines of “shouldn’t this be relatively easy under Windows, too?”, I checked on my work computer, and while it seemed possible, and indeed my brother once did it for me with his Windows computer, it was not obvious at all; in fact, I gave up after about four or five click-throughs with little end in sight. Hence, at the local office and having set up my laptop to create a local wifi hotspot, I’d created a mildly-amusing-to-me setup on my temporary desk, plugging in my personal laptop to the corporate network, running a hotspot using its wifi card, and using my work computer normally over wifi as well as doing data transfers from the iPad. 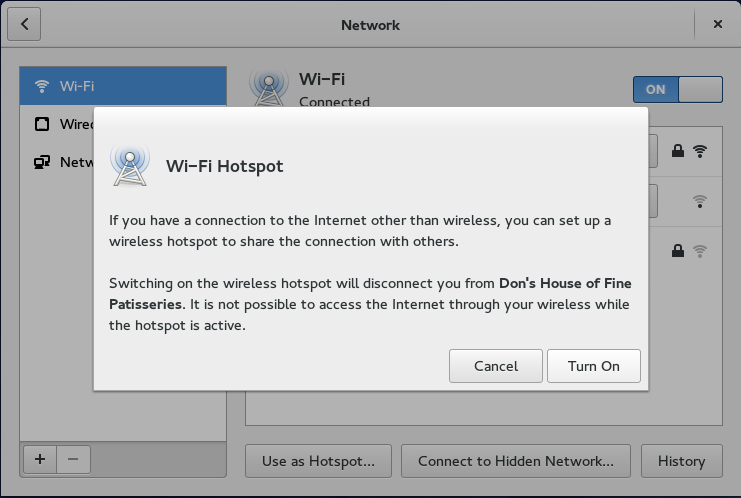 Back at home and at my home office, I mention my difficulties in getting internet access to my supervisor (who isn’t a computer techie type), who thought that creating a hotspot under Windows couldn’t be done, or at least he didn’t realize it could be. Further discussing this with him, I explained the situation saying “I don’t mind trying to find other solutions — that *is* my job — but after not having two A Plans (the motel internet not working for the iPad, nor having wifi at the office), then suddenly not having a plan B (the company cell phone internet not working), having to depend on my personal phone’s data plan, then having to depend on the client’s internet access but not having enough access for all devices, and finally coming up with a part-time solution to replace one of the A-plans — using a second of my personal resources in the form of my personal laptop — there’s a problem here,” to which he agreed. Jovially, he did however suggest that “in the next leg of your travels, I happen to know that if you can go to the local library, they have free wifi”. 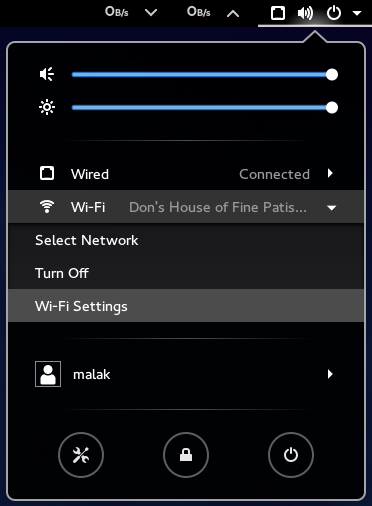 This made me realize that if necessary and if possible, I could also try the free wifi at the local Tim Hortons (a popular Canadian chain of coffee and doughnut shops), assuming that there is one in the remote town where I’ll be visiting next.